Personal Services Income (PSI) – What is it and how does it affect me? Let’s start at the beginning, what exactly is regarded as PSI? PSI is defined under s84-5 ITAA97 as ordinary or statutory income that is gained mainly as a reward for the personal efforts and skills of an individual. The ATO takes a simple approach to their assessment of ‘mainly’, if the income you earn is more than 50% for your effort and skill then you classify this income as PSI. It is important to understand that a business can have both PSI and non PSI income. So the concept of PSI is not applied across an entire business necessarily. You can, however, immediately see that for the bulk of medical professionals their income could be deemed to fit into this category. It is their personal effort and skill that is generating the income, it is not the sale of a product or the operation of certain equipment that generates the income. Once we accept that the income received fits the PSI definition, the question becomes whether the individual circumstance mean the operator is conducting a Personal Services Business or whether they are in fact subject to the PSI Rules. 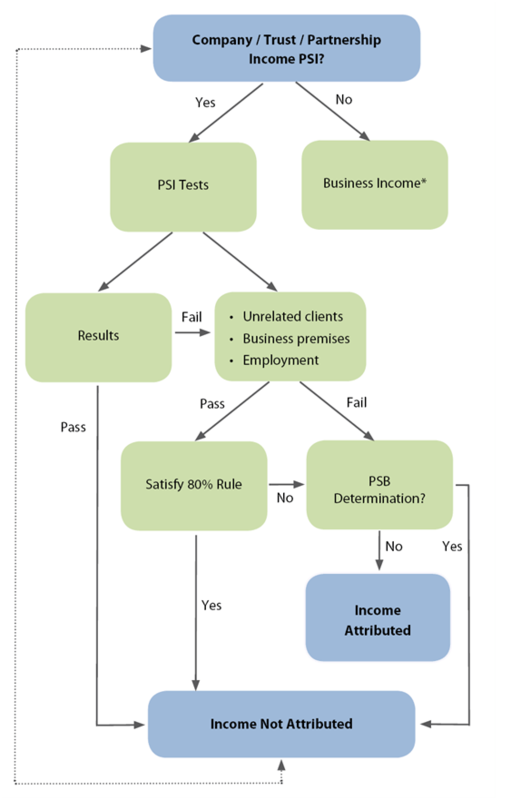 As such the classification of your income as PSI is not the end of the process however, there are other rules that are applied to PSI to determine whether the income must be attributable back to the individual or whether the individual is in fact operating a business. The flow chart of these rules is shown below as diagram 1. The first rule is known as the Results Test. 1 under your contract or arrangement, will your business only receive payment when the work has been completed, that is, after producing the contracted result? 2 Does your business need to provide the equipment or tools necessary to do the work? The Results test simply looks at whether the engagement of your services and the payment due is dependent on a certain result being achieved. Take the example of a carpenter who provides a quotation for a job, it is a fixed price for a fixed outcome. This satisfies the Results test, he doesn’t get paid until the job is complete. The same carpenter who is engaged on a daily or hourly rate is not dependent on achieving a certain result to receive their income, this does not satisfy the results test. Generally medical professionals get paid regardless of whether a specific outcome is achieved, many are engaged on a daily rate via locum placements and as such they do not satisfy the Results Test. Some elective or cosmetic surgeries may fall outside of this as they are a fixed price for a set result, if there are complications the practicioner is required to provide further services for no further income. It comes very much down to the service offering and particulars of the arrangement. For your business to avoid the PSI Rules you require 75% of your PSI income to satisfy the Results Test. If your PSI classified income does not satisfy the Results test, it then goes through a second set of tests to see whether the PSI Rules apply. There are 2 elements to this second filter, you now need to satisfy 1 of three tests and also pass the overarching test, the 80% Rule. The Unrelated Clients Test is satisfied if the business provides services to 2 or more clients who are not associates of each other or associated with the key individual. Due to the number of patients seen by medical professionals there is no question that the unrelated clients test is satisfied. 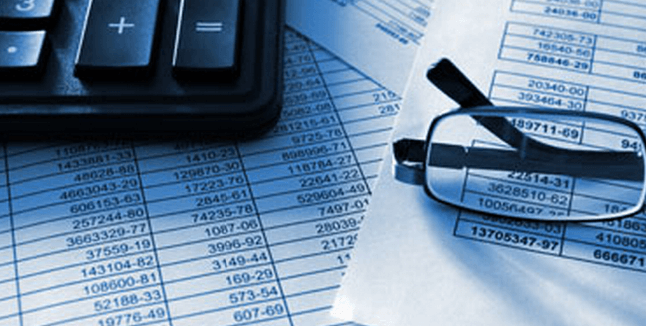 The Business Premises Test is satisfied if at all times of the year the business premises are used solely for the operation of the business and are not connected in any way to the residence of the individual performing the services. As most medical professionals either operate in the hospitals or shared rooms, medical businesses rarely satisfy the Business Premises Test. The Employment Test is satisfied where more than 20% of the income generated can be attributed to the activities of an employee who is not an associate of the key individual. Alternatively to this if an apprentice was employed for more than 50% of the year, the employment test can be satisfied. As can be seen, of the 3 tests above the Unrelated Clients test provides the best opportunity for medical business to move through to the next and final test. The 80% Rule. The catch-all provision in this second tier of tests is the 80% Rule. This is determined where you derive less than 80% of your income from one source or set of associated entities. Even if you were to deem Medicare as one source, most medical professionals would not derive 80% of their income from Medicare, income received from health funds and patient gaps would see the Medicare fall below the 80% threshold. However if you apply these rules to your own practice or private income sources and conclude that the PSI Rules apply, the impact is as follows. 4 your business may have additional pay as you go (PAYG) withholding obligations. If on the other hand you run the tests over your business and conclude that, due to the Unrelated Clients test and the 80% rule, you are operating a Personal Services Business, the PSI Rules do not apply and you avoid the extra requirements outlined above. It is important for all medical professionals to understand these subtle differences (or work with an accountant who understands them), even if you are operating a Personal Services Business you are still required to disclose the level of PSI that you receive. The ATO will maintain a high level of scrutiny in regard to how you are managing this PSI income through your business and ultimately the Anti-Avoidance provisions contained in Part IVA of the Income Tax Assessment Act will apply as always. For those unfamiliar with these provisions they aim to be a ‘catch-all’ for any tax structure or strategy whose primary benefit is the reduction of tax. Historic tax saving strategies of retaining earnings in a practice company, distributing business profit to lower tax rate individuals and paying the key person a below market rate for their services have all been expressly stated as the type of thing that would attract the Anti-Avoidance provisions. Please contact us on info@mediqfinancial.com.au or 13000 MEDIQ (63347) for a complementary review of your current business structure or to organise an initial consultation.